Sarajevo May 29, 2014 (AFP) – A former religious leader of Bosnia’s Muslim community, Mustafa Ceric, said yesterday he would run for the presidency in October’s election. ‘It is time for a unified state policy in the interest of all citizens,’ Ceric told reporters announcing his candidacy for a post in Bosnia’s three-member presidency. After the 1992-1995 inter-ethnic war in Bosnia, the country was divided into two semi-autonomous entities, linked with weak central institutions. One of them is Bosnia’s joint presidency, comprising representatives of the three main ethnic communities – Muslims, Serbs and Croats. 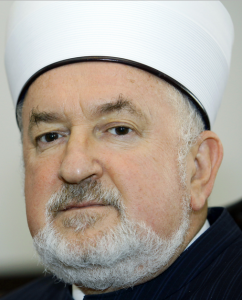 Ceric was Bosnia’s grand mufti from 1993 to 2012. His support was often crucial for Muslim community’s political representatives in the elections. Although he was considered as a moderate religious leader both at home and abroad, Ceric has often criticised Bosnian Serb political leaders and their failure to support joint Bosnian institutions. Dr. Mustafa Ceric held the position of Chief Mufti of the Bosnian Islamic Community for almost 19 years but was replaced in September 2012. He has a long an extensive history of ties to Islamist since the time of the 1992-1995 Bosnian War and has had a long association with Global Muslim Brotherhood leader Youssef Qaradawi. Questions have also been raised concerning what have been described as Dr. Ceric’s “shady business dealings” and his efforts to placate extremists and silence their moderate critics. Considered by some to be a leading “liberal” Islamic leader, these issues raise serious questions about Dr. Ceric and his fitness for government office. For a complete profile of Dr. Ceric, go here.